The Business Communication Process Or, the Business Communication Cycle Or, the system of Business Communication Or, elements/steps of the Business Communication Process, Meaning of communication process. Hello dear friends here you will get the communication process, Business Communication Process, System of Business Communication, Steps of business communication. I hope that you will get advantage from here. Communication is the process of exchanging information and understanding from one person to another person. It provides a bridge of meaning by which people can share their feelings. The communication process has eight sequential steps which are shown in the following figure. In any kind of communication at first the sender develops an idea which he/she wants to transmit. In this step sender convert the idea into a message by using suitable words, charts, or any other symbol. Here the sender uses his/her own ‘filter of concept’ to develop the message. After encoding the message sender takes initiative to transfer the message to receiver. Sender also selects proper media for the transmission of message. Here receiver receives the message which is transferred by the sender. If the receiver does not receive the message then the communication failed. To understand the received message the receiver need to decode the message. 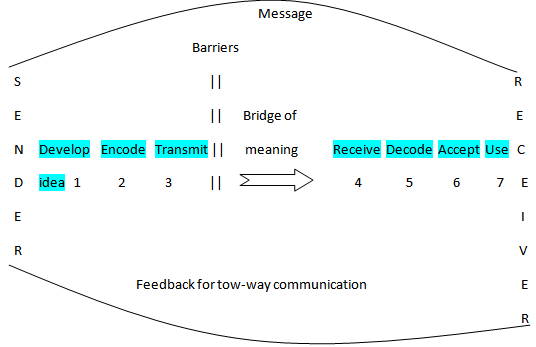 Decoding is the process of ‘explanation of the message’ which produce the meaning of the message. This step is very important for the success of communication because understanding of the message completely depend on it. After decoding, it depends on the receiver whether he/she will accept or reject the message. Acceptance mainly depends on the credibility of the sender and attitude of the receiver. This step also controlled by the receiver. The receiver can use the message immediately or in future considering his/her interest. It is the last but perhaps the most important step for successful communication. In this step the receiver responds to the sender. The loop of communication infect completes with the response of the receiver, which is known as feedback. Whether the message is accepted or not can be realized by the feedback of the receiver. These are the steps of the communication process. It should be mentioned that there are some barriers in the communication process which can disturb whole process. Dear friends please go to this link for more information about Meaning of communication process. Hello dear guys thanks for visiting this site and post. Friend if your like this Communication Process post than this post share with your friends.